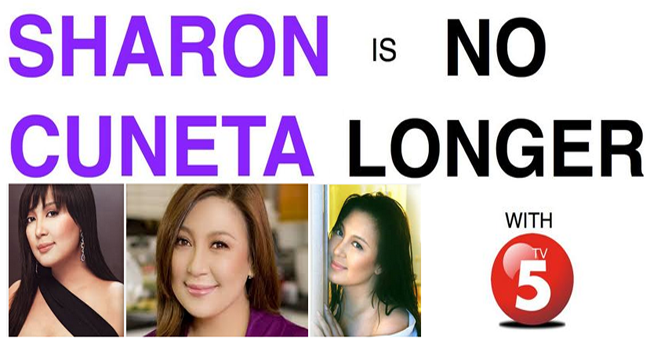 Megastar Sharon Cuneta broke the news that she is no longer with TV5, on her Facebook and Twitter accounts. In 2011, the actress-host signed a staggering P1 billion contract of five years with TV5, but canceled it after 3 years. Only 12 days prior this announcement, she posted on her Facebook page an open letter about her struggles and depressions. In it, she apologized to her fans for making mistakes that had affected her 36 years of career in show business, including her weight. She was in ABS-CBN for 24 years before she changed network to TV5. In TV5, she had her own talk show ‘Kasama Mo, Kapatid’. She even became the main actress in the sitcom ‘Madam Chairman’ ,wherein she acted as a chairman of the barangay (village) while having a problem with her teenage kids and unfaithful husband. She also co-hosted the show ‘The Mega and The Songwriter’ with Ogie Alcasid. She also did some hosting with Aga Mulach in ‘Pinoy Explorer’, a travel show. It was reported that she was suppose to have another sitcom called ‘My Pirated Family’ with actor-host Richard Gomez. She said that she would drop hints and clues to let people know what she’s up to. TV5 expressed their gratitude to Sharon Cuneta and wished her well in her chosen endeavors. Megastar had always been supported by her fans. Her life is an open book and many believe that with her new decisions, she would be able to come out of it as a stronger individual.